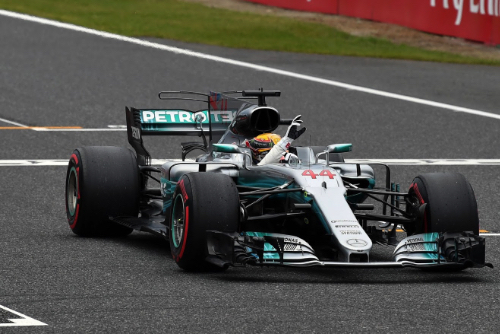 Lewis Hamilton smashed the lap record at Suzuka with a time of 1:27.319 he clocked in qualifying for the Japanese Grand Prix. The lineup for the weekend was: Mercedes - Lewis Hamilton and Valtteri Bottas; Red Bull TAG Heuer - Daniel Ricciardo and Max Verstappen; Ferrari - Sebastian Vettel and Kimi Raikkonen; Force India Mercedes - Sergio Perez and Esteban Ocon; Williams Mercedes - Felipe Massa and Lance Stroll; McLaren Honda - Fernando Alonso and Stoffel Vandoorne; Renault - Nico Hulkenberg and Jolyon Palmer; Toro Rosso Renault - Pierre Gasly and Carlos Sainz; Haas Ferrari - Romain Grosjean and Kevin Magnussen; Sauber Ferrari - Marcus Ericsson and Pascal Wehrlein. Bottas would get a five-place grid penalty for a gearbox change as would Raikkonen. Palmer would get a 20-place grid penalty for a power unit change, and Alonso a 25-place for a power unit change. Bottas went quickest in the morning practice with a time of 1:29.055 on the soft tires, but then crashed. Raikkonen also crashed. The ambient temperature at the start of qualifying was 73 degrees Fahrenheit (23 degrees Centigrade) and the track temperature was 81 degrees Fahrenheit (27 degrees Centigrade). Bottas had a scary moment early in the 18-minute Q1 when he went off and nearly hit the barrier exactly where Raikkonen had in FP3. Bottas recovered to take second. Then Verstappen turned a 1:29.181 to grab the lead. Hamilton responded with a 1:29.047. With the first runs done, Magnussen was 15th and on the bubble with Grosjean 16th and Vandoorne 14th. Out front, it was Hamilton, Raikkonen, Verstappen, Bottas, Vettel, Ricciardo and Perez. The top seven stayed in the pits for the remaining minutes while the others went back out. But then Grosjean crashed in the esses and the session was red flagged with just over a minute remaining. That ruined many a driver's lap. The five drivers who were eliminated at the end of Q1 were: Grosjean, Gasly, Stroll, Ericsson and Wehrlein. The fastest 15 drivers who moved on to Q2 were: Hamilton, Raikkonen, Verstappen, Bottas, Vettel, Ricciardo, Perez, Ocon, Hulkenberg, Massa, Palmer, Alonso, Sainz, Vandoorne and Magnussen. Hamilton, on the super soft tires, set a time of 1:27.819. Vettel, also on the super softs, did a 1:28.482. That put him second ahead of Bottas, Verstappen, Ricciardo and Raikkonen. The cutline had Vandoorne tenth, Massa ninth and Alonso 11th. All the drivers used the super soft Pirellis except Raikkonen and Bottas who ran the softs. All but Verstappen, Ricciardo and Raikkonen went out in the final minutes. The five drivers who were eliminated at the end of Q2 were: Vandoorne, Hulkenberg, Magnussen, Palmer and Sainz. The fastest 10 drivers who moved on to Q3 were: Hamilton, Vettel, Bottas, Verstappen, Ricciardo, Raikkonen, Ocon, Perez, Massa and Alonso. Could anybody beat Hamilton during the 12 minutes of Q3? All the drivers were on the super softs for this session. Bottas turned a 1:27.986, which Hamilton then beat with a 1:27.345. Vettel slipped between them with a lap of 1:27.797. Ricciardo, Verstappen, Ocon, Perez and Massa rounded out the top eight. Raikkonen went off and did not record a time, and Alonso did not go out at all. Three minutes remained as the drivers began their final runs. Hamilton turned a 1:27.319 to keep his pole ahead of Bottas who did a 1:27.651. Vettel's 1:27.791 put him third. Ricciardo, Verstappen, Raikkonen, Ocon, Perez, Massa and Alonso rounded out the top 10. Raikkonen and Bottas, however, would move back five places each. Hamilton had qualified on pole at all the current F1 circuits except Suzuka, but he took care of that statistic with a smashing lap.